Join us for the 2019 NorCal Tour de FIT. The Tour has taken a new route. No shortcuts but a new format with cool new incentives. The NorCal Tour de FIT is a series of running / walking events in Northern California. The purpose of us organizing the tour is to provide some cool incentives and perks to those committing to an active lifestyle through the year. Training T-Shirt. Your membership includes a long sleeved technical tour t-shirt. Sizes available from XS-2X. Tour Medal Eligibility. As a Tour de FIT member, you’re eligible to earn the Tour Medal. Finish five Tour events – at least two events in each Tier 1 and Tier 2 – and earn the 2019 Tour de FIT medal. 2019 Tour de FIT membership will be accepted through March 9th, or when 300 members are reached, whichever comes last. Commit! Sign up for a 2019 Tour de FIT membership. Pick Up your Swag. 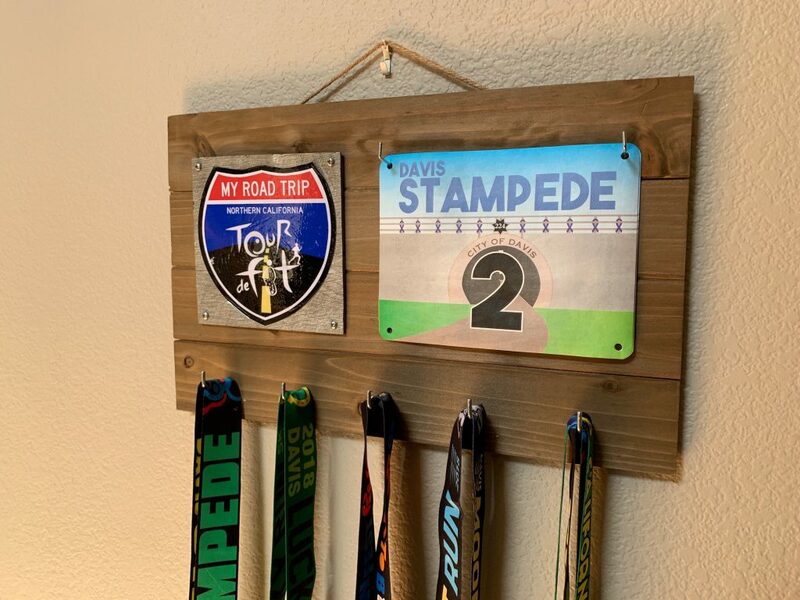 Entries received by March 9 can pick up their medal racks starting at the Davis Lucky Run. Your t-shirt will be mailed. Determine Your Goal Events. You’ll need to complete five events to earn the Tour medal; at least two “Tier 1” and two “Tier 2” events. Do your thing on race day. Enjoy the VIP tents as a place for private porta-potties, complimentary refreshments and beverages. Your race bib will have a special sticker on it to indicate your Tour de FIT membership. Finish events and collect medals. The Tour de FIT is not about how fast or slow you run or walk, but about simply encouraging you to stay active! Bask in the awesomeness of your achievement. Display your medals proudly! Q: Do I need to register for the Tour de FIT to participate? Q: I can’t make one of the races, but still want to participate. Suggestions? A: Many of the included events offer a virtual option. Q: Can I mix and match distances? A: Absolutely, the only requirement is that for an event/division to count towards the Tour medal, it must be a timed division (i.e., the kids fun run does not count). Q: Do athletes who complete all the A Change of Pace events receive anything else in addition? A: First, congrats on planning on participating in all five events! (Davis Stampede, Lucky Run, Moonlight Run, Labor Day Run and Rocktobrewfest). All Tour de FIT members who complete these five events will be eligible to receive a free 2019 Davis Turkey Trot entry (any division). Enjoy!